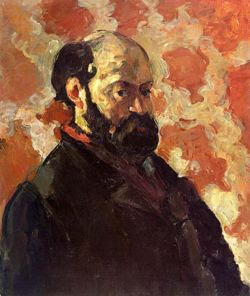 Paul Cézanne (January 19, 1839 – October 22, 1906) was a French artist and Post-Impressionist painter whose work laid the foundations of the transition from the 19th century conception of artistic endeavour to a new and radically different world of art in the 20th century. Cézanne can be said to form the bridge between late 19th century Impressionism and the early 20th century's new line of artistic enquiry, Cubism. The line attributed to both Matisse and Picasso that Cézanne "is the father of us all" cannot be easily dismissed.